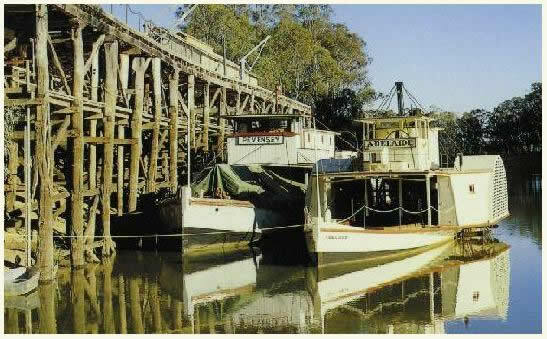 The Museum of the Echuca Historical Society tells the story of Australia's, paddle boat capital and largest inland port. The home of the P. S. Adelaide, the World's oldest, wooden-hulled, working paddle steamer. Echuca in Victoria, founded in 1853, by ex-convict Henry Hopwood, from Bolton, in Lancashire, England, became a very important commercial centre. Hopwood, realising that Echuca was an ideal crossing place for the cattle from the North, on their way to the gold fields at Bendigo, set up a punt. The government railway reached Echuca in 1864, connecting it to Melbourne and its port. Wool from the Riverina and Redgum for railway sleepers from the forests along the Murray River were transferred at the Echuca wharf, from the river boats, to the railway and thence to Melbourne. There to be loaded on to ships and taken to America and Europe. At the Museum, Echuca's colourful history is depicted in the many photographs on view and the multitude of exhibits displayed. Our resource material includes information on many of the paddle steamers that plied the river and their captains and owners. The Riverine Herald, going back to 1863, is on microfilm, as is the Bendigonian, 1895 to 1920. We hold the Minute Books of the Echuca Borough Council, from its foundation in 1864 and also their Valuation and Rate Books, as well as the records of the Water Trust. We hold Echuca cemetery records for the years 1860 to 1989, also the Patho and Kyabram cemetery records. In addition we hold records of the Moama cemetery, which is in New South Wales, on the other side of the River Murray. We have Echuca District Hospital records for the years 1882 to 1912. Information on the numerous hotels that were in Echuca and their licensees is available. We have records relating to the many business operating in Echuca, including the saw mills, foundries and flour mills. All this and much more is available to help the researcher.